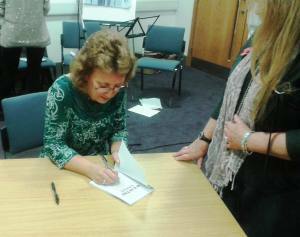 News from the fab launch of Heather’s new collection – it’s a joyride around the carpet industry in Kidderminster – great poems/stories/scripts – something for everyone. 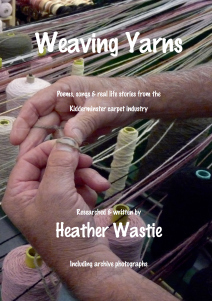 This post is all about the fact that Weaving Yarns, poems, songs and real life stories from the carpet industry, is now available to buy! Here is a link for online purchases from Black Pear Press who have been excellent to work with and have produced a first class item which I’m proud to hold in my hand, read from and generally wave in the air at people. http://blackpear.net/authors-and-books/heather-wastie/ You can also buy copies in the Museum of Carpet shop and from me of course! I am indebted to the following performers who helped me put together an evening’s entertainment of poetry and music, performing their own work as well as mine: Sarah Tamar, Kathy Gee, Mike Alma, Polly Robinson and Kate Wragg. Many thanks to you all for your wonderful work. Do you have a new book of poetry in the works, Polly? Yay! Best of luck with it!